On weekdays, from Monday to Friday, you make a run at 08:10 and extra 5 minutes are postponed races of 14:15 and 18:00. The exact dates change from year to year. 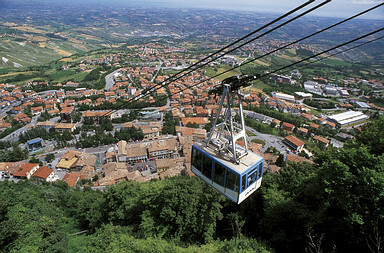 The trip that connects Borgo Maggiore to the Historical Centre, lasting about 2 minutes, you will see over 200 km of Adriatic coast. To access the boarding take the elevator behind the stairs and select floor 2. If there is a significant influx of continuous service. Overall there are three parking spaces reserved two adjacent main entrance to the cable car station and one at the end of the first parking area, continuing to the right. To facilitate the access to the transport service it is advisable to leave your car at the first level of the station of the cable car to take advantage of the lift for the ascent to the plans. Select plan 1 to access the ticket office, shops, bar and full bathroom plan or 2 for boarding. If you decide to park in front of the main entrance, there are two reserved seats. Two other cars are available if you access the old town of Borgo Maggiore, one located in front of the arcades of Via O. Scarito and the other along the road after the petrol station on the right. To access follow the descent of the main without passing on the sidewalk to avoid a staircase. Halfway down on the right, you will find the entrance on the first floor of the cable car, after passing a step of 4 cm. Visit the page dedicated to accessibility to find the map of distribution of the cable car, the map of toilets and all the necessary information.